When Prime Minister Manmohan Singh and Pakistan President Asif Ali Zardari sat down to talk on the sidelines of the 16th Summit of the Non-Aligned Movement (NAM) late Thursday evening, they both appeared keen on avoiding a sense of deja vu. 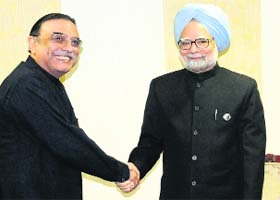 PM Manmohan Singh meets Pakistan President Asif Ali Zardari on the sidelines of the NAM Summit in Tehran on Thursday. Back home with the Opposition on the warpath, Prime Minister Manmohan Singh is used to having his schedules being disrupted in Parliament. 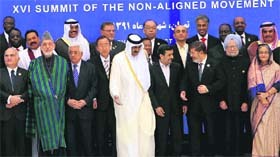 Prime Minister Manmohan Singh and other leaders at the NAM Summit in Tehran on Thursday. 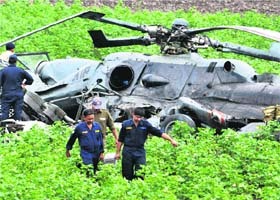 Nine Indian Air Force personnel, including five pilots, were today killed when two MI-17 choppers collided mid-air just after take-off from the Jamnagar airbase in Gujarat. The Russian-made twin-engine copters were on a training sortie and flying in close formation. The Haryana Public Service Commission has created �much� confusion by not making public the answer key, the Punjab and Haryana High Court today ruled before deferring the main written examination for HCS (Executive Branch) and other allied services. While the BJP is pressing for the cancellation of all the coal blocks allocated by the UPA government, Coal Minister Sriprakash Jaiswal today rejected the Opposition demand on the plea that it is untenable. For those looking for drama in the dull life of government servants, here's one with a post script: a chief parliamentary secretary (CPS) poses as a veiled Muslim woman patient and busts a high-ranking government doctor moonlighting at a private hospital in Mohali. 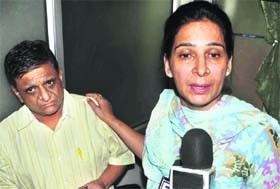 CPS Dr Navjot Kaur with Dr Sameer Kaushal, who claims to be a trustee of Mohali�s Amar Hospital. An apparently overzealous drive of the city police against local Romeos went horribly wrong on Thursday when a girl traveling with her boyfriend in a car committed suicide after the police caught them in the presence of reporters and photographers. Indians are among the foreign students facing an uncertain future, including possible deportation, following the British Government�s decision to strip the London Metropolitan University�s (LMU) right to sponsor visas.